Once again, I find myself re-hashing the official AudaxSA ride report, but on this occasion it does give a somewhat more descriptive account than usual. I was jumpy and on edge as we gathered for this year’s Cape 300km ride. It’s not the longest or toughest of the local brevets, and we completed last year’s edition with relative ease despite mechanicals and a relaxed social pace. But the nerves that often plague me ahead of important races and events were back with a vengeance. The ride wasn’t the problem, it was the significance – successful completion would mean I had all the qualifiers needed to enter for PBP. It’s not quite the same as an actual confirmed entry for the big event, but it’s only one step removed from that. 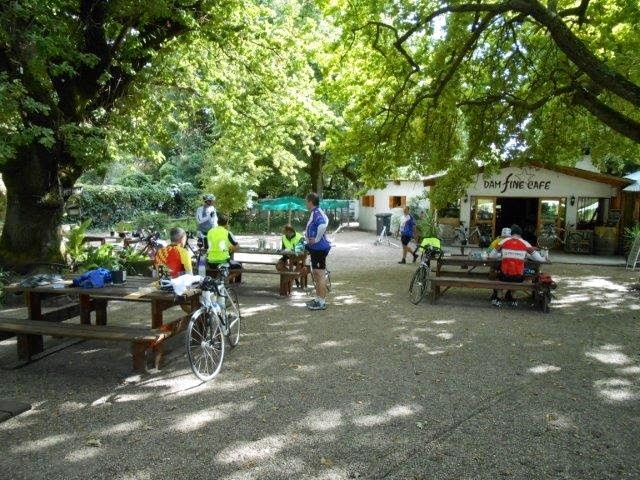 At least I was kept busy before the start – our field of riders had grown yet further from the January brevet. It was a little surprising to see the ride so popular. A 200km in January makes sense – just after the Christmas break it’s a good way to get training again and the distance is not such a big stretch for regular riders. But a 300km ride just two weeks before the Argus (now the Cape Town Cycle Tour) seemed like a recipe to deter potential entrants. But here we were, with 25 riders and I was more than a little disorganized getting them all signed in, explaining brevet cards to the newcomers, and also handing out medals from past rides. The brevet itself was a tale played out in three acts. The scene for the first of those being set just before dawn, as most of us were descending Franschhoek pass. Despite Henri’s convincing re-assurances that we’d been looking at the wrong weather forecast, clouds rolled across the mountains and rain fell. A light drizzle at first, growing quickly into a full blown downpour. 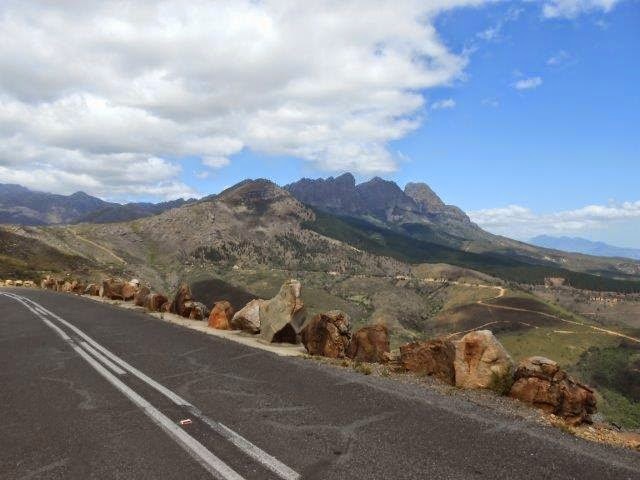 The route down the pass towards Theewaterskloof is usually a fast, fun, occasionally chilly blast down to the dam. In the dark though, on wet roads, it was a rather different experience. Brakes squealed ahead and behind as riders picked cautious lines through the snaking, slippery bends at speeds considerably below the norm. One rider even commented on Facebook later that he’d actually got off and walked for about 100m downhill, the visibility was that bad. 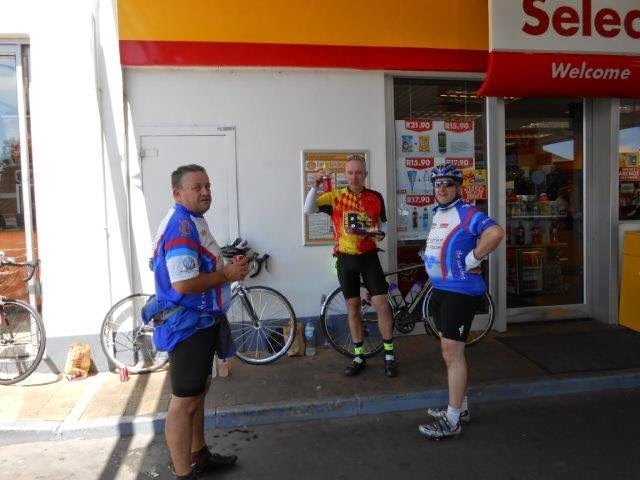 Randonneurs around the globe would have instantly recognised the scene a little way beyond at the first control – the Shell garage in Villiersdorp. Bikes propped up all over the place with groups of riders huddled around, a little cold, a little damp, but still smiling and chatting, with vending machine coffees in hand which were considerably better than their R8 price suggested. Or maybe, it was just that they were warm and contained at least trace amounts of caffeine. Fortunately, departing the control also saw the end of the opening act. As the road turned downwards towards Worcester, so the clouds started to lift upwards. Patches of blue began to appear overhead, allowing shafts of sunlight through to pick out the sublime landscape of mountains, fynbos, and farms along the valley. The bad weather was past, puddles along the road were drying out, and act two could begin – riders enjoying a glorious late summer’s day to be out on a bike. 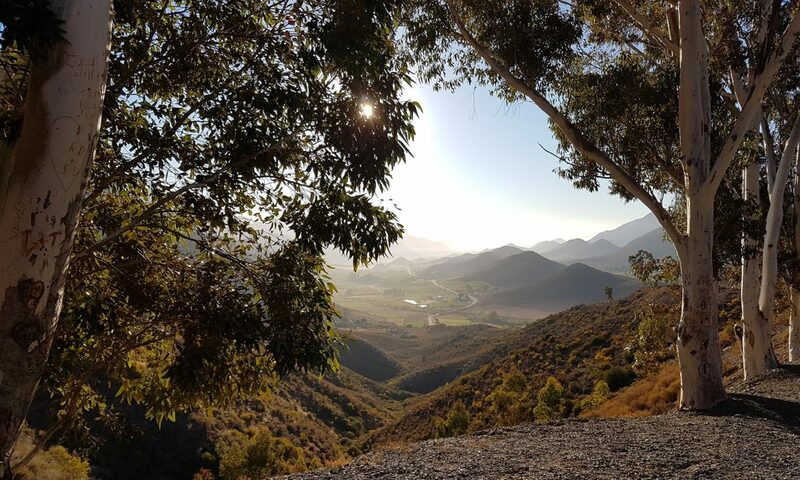 The pre-ride briefing offered the option to use Die Eike at the start of Slanghoek valley as an alternative control to Rawsonville – it being just a couple of kilometres further along the road. As the tail group pulled in, it was apparent this had proven a popular suggestion. Close on half the field were there, and whilst the service was a bit on the slow side – the coffee was strong, and the breakfasts seemed to be hitting the spot. 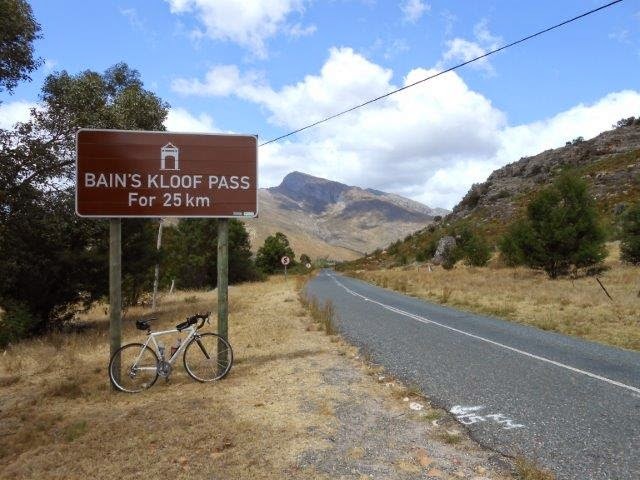 Once water bottles and bellies had been filled, it was time to set out and savour the most scenic section of the ride – Slanghoek valley, leading to Bainskloof pass beyond. In a valley which faces predominantly North, with a wind that was supposedly from just East of South, it was surprising to meet occasional blasts of headwind along the way. It was tempting to hope the forecasts had been wrong, and there would be no battle with the wind later on in the day. It didn’t seem especially likely though, the tightly packed surrounding peaks appeared to be a more plausible cause of the shifting wind direction. Sad to report, but the road surface on Bainskloof is not improving – already rough and potholed, there are now a few places where the steeper edges are clearly starting to break up. The roadside of the lower section had also been booby-trapped with Duwweltjies – resulting in a second puncture of the day for the tail group. None of this detracted from the dramatic beauty of the pass though, especially for those in the field seeing it at cycling speed for the first time. The climb itself isn’t steep or difficult, but it’s surprisingly long. In fact it’s a perfect test for rider’s Audax credentials: the ability to maintain a steady pace and strong resolve. 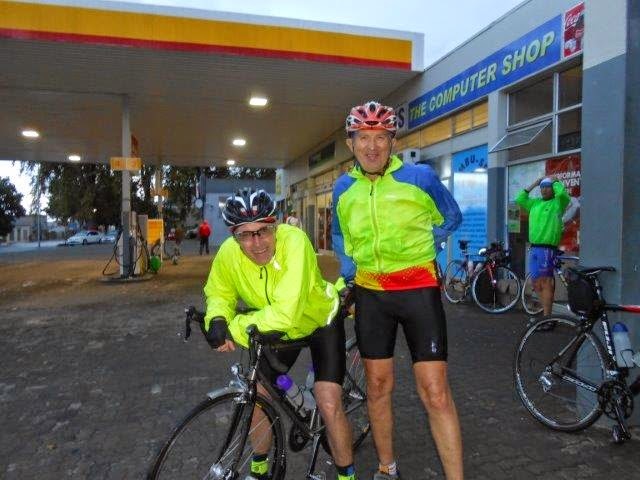 As the last riders came into the 3rd control at the Shell Garage in Wellington it was clear that everyone had passed the test. One rider’s machine though was faring somewhat less well – after two punctures, Hendrik’s rear freehub was now protesting loudly. With a predominantly downwind leg of 40km to the next control, it was a cruel blow – instead of being able to enjoy some fast and easy freewheeling, he had to keep pedalling for the entire leg to prevent the chain fouling. He was riding probably the only 10 speed fixed gear bike in the Cape. The tail group hatched several plans to remedy the fault though – the first of those being a liberal lube at the next control. 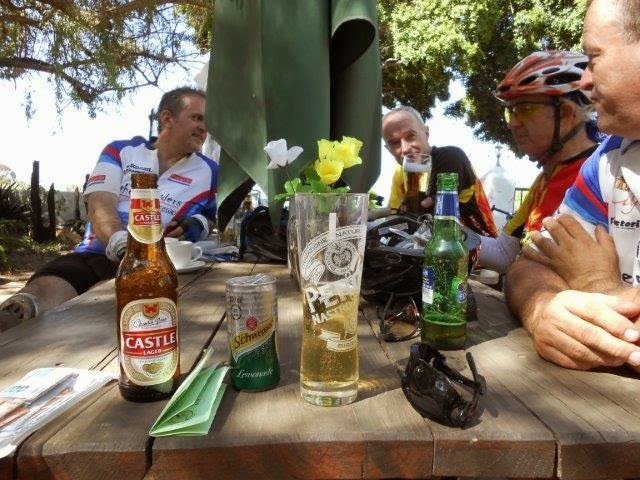 A very attractive plan as it transpired, since Riebeek West offered up a very friendly roadside pub at which riders could also lube up with some beers whilst the repairs took place. Luckily there was no need for plan B – rolling out of the control back towards Riebeek Kasteel the squeals and chain lock-up were gone, replaced by a re-assuring hum. On the short stretch to the next control, it was clear that the pleasant easy cycling would soon be coming to an end – act two was drawing to its close. The weather was back, only this time in the form every cyclist dreads, strong headwinds. It wasn’t much of a problem over the short distance to the final control in Malmesbury, but it was clear that the final 50km home would be a much tougher task. After a brief respite enjoying cappuccinos in the Wimpy, it was time for the tail group of riders to go out and battle the beast. Every cyclist knows the most important word in that last sentence under such conditions – “group”. The wind was truly brutal, easily the worst most of us had experienced since the Cape of Storms Argus in 2009. Progress was painfully slow, but luckily the group had several riders still feeling fairly strong who could alternate places at the front and break-up the workload a little. The tail group of 6 riders soon became 7 as we picked up Markus a little way outside Malmesbury. He’d left the Wimpy ahead of us, but had clearly decided the combination of wind and uphill was too much to slog through alone and was trudging along beside his bike. The group slowed, gave him time to latch on and gather his breath, and pressed on – although it wouldn’t be fair to say we sped up much, such was the force of the wind. It was clear this was going to be a low, slow grind to the end. With about 27km to go one rider (me) was beginning to lose good humour, and called for a brief stop. We stood exposed with wind ripping across the fields, joking and swearing about the conditions. At least one bike was picked up and nearly tossed into the field alongside the road, but after a few minutes respite we mounted up again and slogged on. A few kilometres further our group swelled to 8 – Nico had got so fed-up battling the last 70km solo, he’d stopped and waited for us. We’d hoped the wind might drop when the sun finally dipped below the golden fields of wheat to our right, but it didn’t, at least not immediately. We did at least hit some smooth tar though, a joy to sore hands and behinds. Eventually, as the final landmarks came into view over the last few kilometres the wind did drop in force slightly. It had blown its worst, battered our riders, but none were broken as they closed out what was for most the toughest 50km they had ever ridden. The previous 250km now just a distant memory of pleasant and easy cycling. At least there was no sense of anti-climax to the ride. The last 50km may have been one of the most brutal stretches of any of our brevets, the 600 included, but there was simply no way I was going to cave or mess it up with all that completing it meant. My resolve and determination had not wavered for a second as we battled it out – and the relief at the end as we swung into the Vrede entrance was enormous. It was also the last qualifier Nico needed – I forget our exact words, but remember riding up the drive exchanging congratulations. The last big task is to actually secure that place when pre-registration opens on May 10th. With cycling popularity at an all time high, it’s far from certain – going to be a nervous time until my ride place is actually booked. With thanks to Andre Steyn for the use of his photos.